The following review is an Ionarts exclusive. 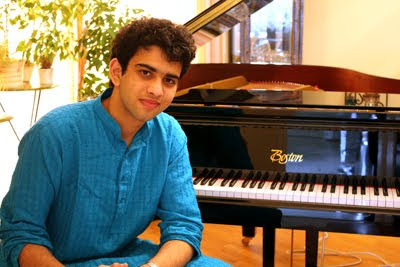 Sunday evening, as part of the maximum INDIA festival at the Kennedy Center, 18-year-old pianist Utsav Lal offered a program of two late-evening ragas with the assistance of tabla player Suryakasha Deshpande. Lal mesmerized his audience with a two-hour improvised program over a single droning pedal point. With the damper pedal perpetually down, Lal was unencumbered by the twelve-note limitations of the modern piano -- Classical Indian octaves can have twice that number of microtones -- by creating and sustaining an array of wavy overtones. One experienced an immediate pianistic flourish that was then floating and soon immersed within a sustained, resonant texture. With the aim of emulating a sitar, Lal took the audience through the slowly unfolding form of the raga: the atmospheric Alap that introduced the theme of raga, followed by the Gat, when the tabla entered, with rhetorical Taans between the two, which then accelerated into the arresting Jhala to conclude. These particular ragas were in eleven- to twelve-beat cycles. Deshpande’s tabla playing was efficient and restrained, while subtly adding pleasing microtones to the texture. Lal ended the program with two Bhajans, both favorites of Mahatma Gandhi, to which some audience members quietly sang along. Although the audience was seemingly pleased by the genuine “unforced fusion” of the musicians and novel sense of extended pacing when compared to most offerings in the Terrace Theater, missing was any technical or harmonic adventurousness pianistically. Where were the hints of the western Classical harmony and colorful jazz training Lal has been receiving at the Royal Scottish Academy of Music in Glasgow? These shortcomings will likely be remedied by his continued journey as an international artist and we wish him all the best. The maximum INDIA festival comes to its conclusion this week, with performances that include this week's concerts from the National Symphony Orchestra (March 17-20), featuring Alexander Zemlinsky's Lyric Symphony, a cycle of seven songs on the Bengali poetry of Rabindranath Tagore.